When the holiday season rolls around, I stock up on candy canes and other peppermint candies. I love all holiday flavors, from eggnog to gingerbread, but I’ve always had a soft spot for candy canes and find that a little bit of peppermint can also put me right in the holiday spirit. These Coconut Peppermint Cookies feature a flavor combination that is a bit unexpected, but that works extremely well. 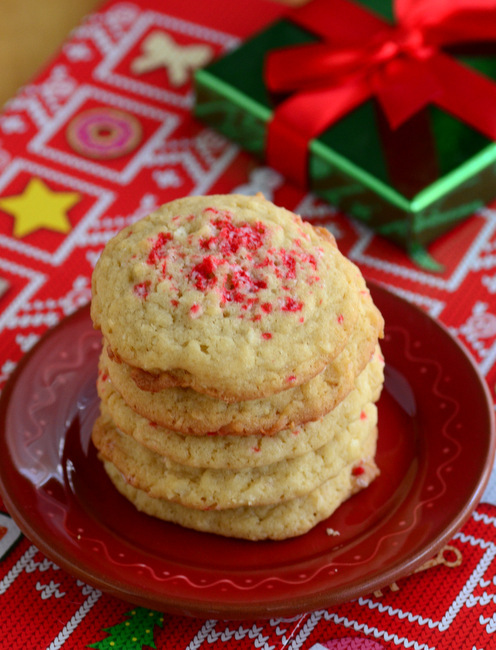 The creamy sweetness of the shredded coconut softens the bright flavor of the peppermint, resulting in a cookie that you’ll want to keep in your cookie jar all season long. The cookie dough gets a generous splash of vanilla extract and a hint of peppermint extract added as you mix it up. Peppermint extract can have a very strong flavor, so I like to use a little bit of restraint when adding it to a recipe. Here, you want the cookies to have a hint of peppermint, but not to overwhelm the coconut in the cookie dough. There is a very generous amount of shredded coconut in the dough, however, so you would really have to go crazy with the peppermint to block out its flavor entirely! I prefer to use sweetened shredded coconut, which has a slightly softer texture than unsweetened, as I feel it simply works a bit better in this recipe. The dough is shaped into generous 1-inch balls and topped with crushed peppermint candies or candy canes. You can make crushed peppermint by whizzing some mints (or candy canes) in the food processor until they are finely ground. You can also usually find small jars of crushed peppermint in the cake-decorating aisle at craft and baking stores. The pre-crushed peppermint is very handy to have for the holidays, since you can add it to hot chocolate and other desserts. I find that the storebought version often has more red in the mix, while the homemade peppermint dust tends to be a bit whiter, so I usually pick up a container if I happen to see one in order to get a little more red into my finished desserts. You should bake the cookies until they are very lightly browned on the outside edge. These cookies should be chewy and the coconut helps to keep them nice and moise, but you still don’t want to overbake them. They’ll stay chewy for several days when stored in an airtight container after baking. I love the contrast of the red and white mint candy with the cookie beneath it, as it makes them look so festive! In a medium bowl, whisk together flour, salt, baking powder and baking soda. In a large bowl, cream together butter and sugars until light and fluffy. Beat in eggs, adding one in at a time, followed by vanilla and peppermint extracts. With the mixer on low speed, gradually blend in the flour until all the dry ingredients have been incorporated, then mix in the shredded coconut. Shape cookie dough into 1-inch balls and arrange on prepared baking sheet, leaving about 2-inches between cookies to allow for spread. Sprinkle each ball of dough generously with crushed peppermint. Bake for 11-13 minutes, or until the cookies are set and very lightly browned around the outside edge. Allow cookies to cool on the baking sheet for about 5 minutes, then transfer to a wire rack to cool completely. These cookies sound so delicious! I never tried combining coconut and peppermint. YUM! I made these and really liked them! I’m vegan so replaced the butter with earth balance and the eggs with flax eggs. I regret that I did not have any candy cane sprinkles because I think the crunch would have been nice. I just used red sanding sugar. I am definitely a fan! Subtle peppermint flavor but definitely there. I haven’t tried out on anyone else yet, but I’ll definitely add to my Xmas cookie folder!